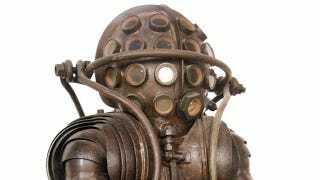 Long before we had spacesuits, we had diving suits. The ocean was the first hostile environment that we sent people into, completely covered with protective gear. And the suits that people created with late-18th century or 19th century technology are astonighing to behold. See for yourself! "A bell was sent to the bottom, and then weighted, the assistant surviving on the air trapped in the bell, and the diver, wearing another smaller "diving bell" on his head,could make his way around a bit to the extent of the tube which would draw on the air in the bell. The two would be resupplied with air in weight barrels sent down from topside, to be retrieved by the diver and lugged over to the bell." – according to Ptak Science Books. One of its two hoses supplied air from the surface via a bellows and the other one evacuated the exhaled air. This airtight oak barrel was used to salvage valuables from wrecks. Another Englishman, Andrew Becker, developed a similar system in the same year, but that suit had a system of tubes for inhaling and exhaling, too. The inventor tested it in the river of his hometown, Breslau (now Wroclaw, Poland). The head of the suit was protected by a cylinder-like tin plate and the design allowed to walk on the riverbed. "It consists of a jacket and trousers made of waterproof leather, a helmet with a porthole, and a metal front. It is linked to a turret with an air reservoir. The reservoir cannot replenish itself, so the suit has a limited dive time duration." – according to Bibliodyssey. The first suit with "heavy-footers" was made by August Siebe in Germany, 1819. A waterproof garment was added in 1837. This type of helmets and equipment was used more than a century. The rubberized mask covered the whole face was connected via tubes to a breathing bag. It could be used as a gas mask, too. This third generation shell (produced between 1929-1940) with a closed circuit breathing system was safe up to a depth of 525 feet (160 m), and had a telephone!